According to a recent LexisNexis/CounselLink survey of 86 property/casualty claims and law departments, controlling defense costs was the key initiative for 2015 and 2016. Respondents of the LexisNexis Property & Casualty Claims and Litigation Cost Containment Survey ranged from vice president of claims, to staff counsel and head of litigation. The survey respondents reported outside counsel spend varied between $10 million to more than $500 million. Reducing legal costs to defend a claim was deemed equally as important as reducing settlement costs by 72 percent of the respondents. The survey found that nearly 65 percent of respondents didn’t feel that throwing more money at defense costs would help reduce loss costs. In a recent blog post, LexisNexis CounselLink outlined six takeaways from the survey. 1. 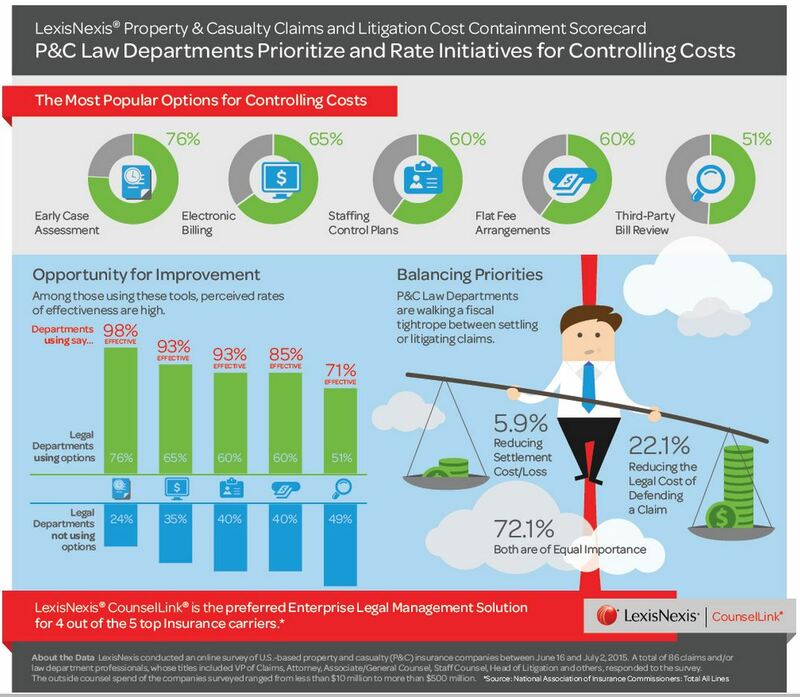 What are the top P/C cost containment initiatives? 2. Which cost containment techniques are effective? 98% said early case assessment is effective. 93% said e-billing is effective. 93% said staff controls/plans are effective. 87% said volume discounts are effective. 85% said flat fee arrangements are effective. 72% said quick-pay discounts are effective. 71% said third-party bill review is effective. 67% said rate freezes were effective. 65% said discount rates with success bonuses are effective. 3. Five easy opportunities for cost containment. 56% do not use volume discounts with success bonuses. 4. Outlook for outside counsel spending. Over the course of the next 12 months, 56 percent of respondents said they intend to send about the same amount of work to outside counsel. Nearly a quarter planned to increase the volume of work sent to outside counsel, and 20 percent planned to decrease outside counsel spend. 5. In P/C, more litigation departments grow than shrink. Most P/C carriers, 57 percent, anticipate staffing levels remaining flat while 39 percent plan to increase staffing. A little less than 5 percent of respondents said their organizations plan to reduce staffing in the next 12 months. 6. Insurance carriers eye technology investments. Nearly 57 percent of carriers expect technology spending to remain flat, while 43 percent said they plan to increase spending on technology for cost containment purposes. None of the respondents said they had plans to reduce technology spending.